Form closed options, which are available on all paid plans, let you add a completely customized message for your users when they visit a closed form. If you don’t want to leave a custom message for the user, you can choose to redirect them to your own website instead. Better yet, setting this up requires no CSS or workaround. To show you how easy it is to use, check out the example below using our donation form template. 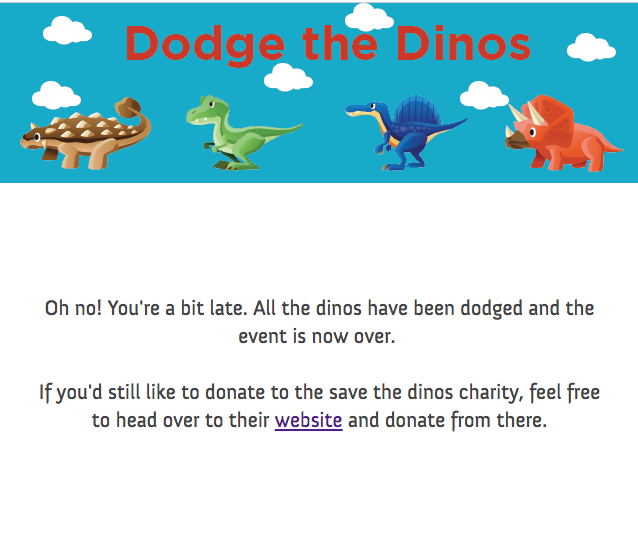 Example: Dodge the Dinos 20K Run is an annual 20K run with a twist. Runners are chased by Wufoo’s very own dinosaurs. Fundraising for chosen charities is urged, and participants can use a donation form for their fundraising. Cue the Dodge the Dinos 20K Run Donation Form. Now, if someone were to try to donate after the event, they’d see the custom form closed message telling them that they’re too late. It could also be good to redirect the person to a website after the event is over. That could be a site to the specified charity or any site you’d wish. Setting this up is just as easy. Simply follow the same steps as before, but choose Redirect to Website instead. Then add the URL from there. In this case, if someone were to view the form after it was closed, they’d be immediately redirected to the specified website. This is a fantastic option if you’d like to send your customers to your own website after a form has closed as well. The form closed options offer you a brand new dimension to keep your users informed or to get them to your website. We really hope you like this new feature and we’ve got loads more to come. If you’d like to learn more about how form closed options work, check out our help center article as well.